This post may contain affiliate links, which means that at no cost to you, I may earn a small sum if you click through and make a purchase. If you’re like me, you’re always looking for fun and creative ways to teach and review letter names. In particular, matching upper and lower case letters. 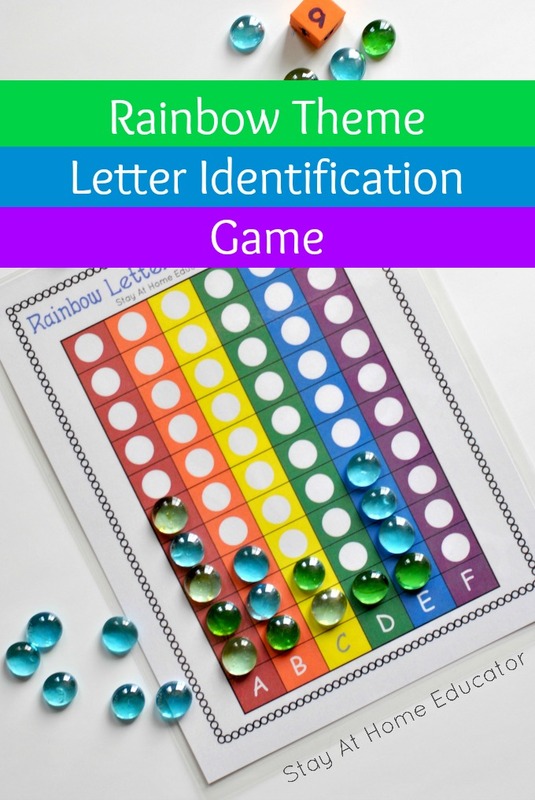 Rainbow Letters Race to the Top is a letter identification game that meets all those requirements, and it’s here just in time for St. Patrick’s Day. The free printable offered at the end of this post means it’s crazy easy for teachers and parents to set up, too. Rainbow Letters Race to the Top is not a new game on my blog. 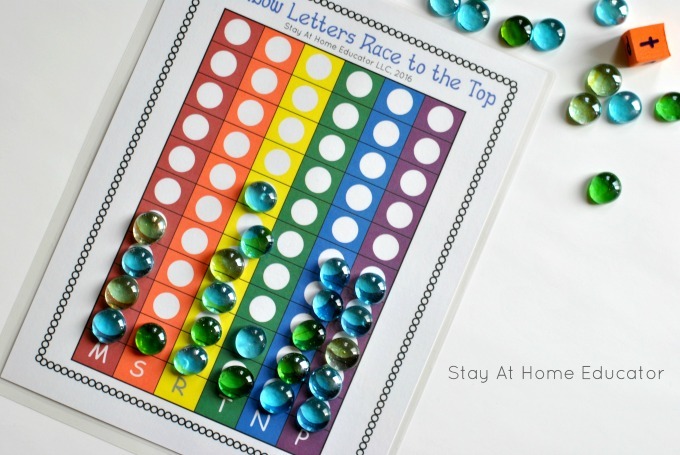 One of my most popular posts features a rainbow themed race to the top game. I made it by cutting strips of colored paper in rainbow colors and gluing them to another piece of paper. Then I added dot stickers and wrote in the letters by hand. While I love the way it turned out, but it certainly took more than a few minutes (think closer to half an hour or more), for me to make enough copies for my small preschool class. But don’t worry. I know your time is valuable. I’ve finally put together a printable, completely free, that is just for you. So you don’t have to spend any more than just a few minutes printing out this game for your preschoolers. The game is simple. And effective. Print out the game boards and laminate them. Do the same with the dice, or just write the letters on a set of blank dice like these. You will also need some sort of counters for the game pieces, like glass floral pebbles, small candies, or buttons. Invite your preschooler to roll a dice and identify the letter. The dice have the lower case letters, while the game boards have the upper case letters, so once the letter on the dice is identified, the upper case letter must be matched on the game board. Continue until one letter has been rolled so many times that its collum is full and has reached the top. This game can be played independently, or two children can compete with their letters by each rolling their own dice to see whose letter reaches the top first. Add more challenge by having each student roll until the game board is completely blacked out, giving tons of practice in letter identification! For your convenience, I’ve made two versions of this game. The first in the printable follows the same letter order as my phonics curriculum. This means that after every few weeks you have a game board to use to review the most recent letters you’ve taught. Or, you can use the second set of game boards in the printable, where the letters are in alphabetical order. Either way, your preschooler will enjoy this fast paced letter identification game. Get Your Free Letter Identification Game! If your think your students or children will enjoy Rainbow Letters Race to the Top, you can get your free copy by clicking the giant red button below. 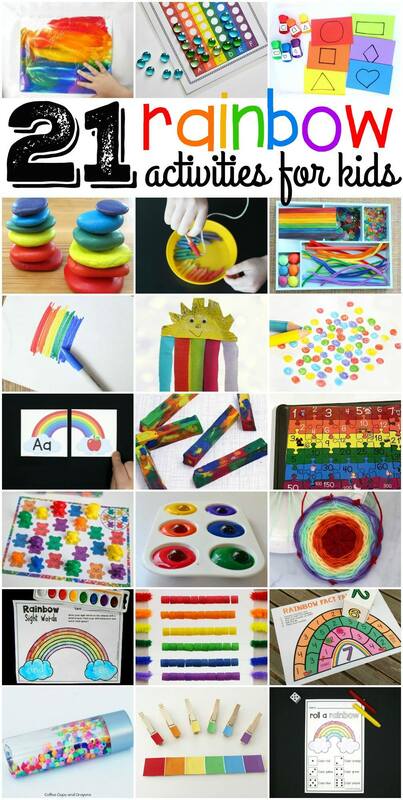 Looking for More Rainbow Activities? Be sure to check out this collection from the best kid bloggers out there! Want more rainbow activities? Check these out, too! I’ve paired up with some of the best kids activities bloggers to bring you more rainbow activities! My kids love the rainbow letter race. Do you have a number one? Ooh…I don’t have a number one but that is a great idea! Going to make one now! Visit Sarah @ Stay At Home Educator's profile on Pinterest.